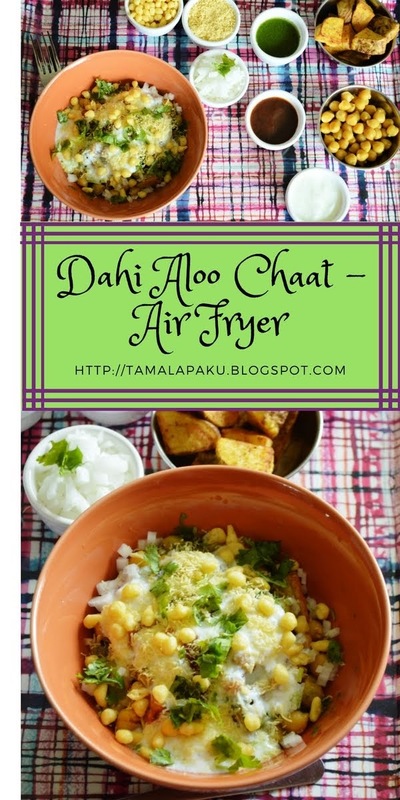 The second recipe which is a family favorite and yet another recommendation from my kids is this Dahi Aloo Chaat. Since the appearance of Air Fryer in our kitchen, making aloo fries has become a new normal. The kids got very comfortable with making these fries that it has become a midnight snack for them. The typical street food attracted my kids when they had it at their friend's place. So the next time they made Aloo fries they wanted all the ingredients for the chaat and went ahead with the setup and enjoyed it. The platter as shown in the picture was my share and I assembled it on the tray, took the pictures and guess what happened later. The older one swapped her bowl with mine saying my assembly is prettier than hers and the rest is history :). In a wide mixing bowl, add the cubed potatoes (I didn't peel them), spray oil and ensure all the cubes are coated evenly. Sprinkle all the spices tossing the potatoes. Preheat the Air Fryer to 400 °F. Toss in the seasoned potatoes and let it run for about 20-22 minutes or until the potatoes turn crispy. Make sure to toss them every 5 minutes. In a bowl, add the crispy potatoes, seasoned Garbanzo beans, chopped onions, coriander-mint chutney, tamarind date chutney, beaten yogurt, sev and/or boondi and garnish with chopped coriander leaves. Sprinkle additional chaat masala and red chili powder if needed. Serve immediately. To conclude this series on steamed dishes, here is another millet based one which is my personal favorite. Thinai is Foxtail Millet in Tamil and Kozhakattai is a steamed dish. These days, my little one has started disliking idlis in any shape or form while the adults at home love them. So it was a tough one for the kids but the adults loved them. I had made a different version of these kozhakattai to a potluck party and was a great hit with everyone (Indian and non-Indian crowd). * I washed the millets, dried them on a clean kitchen towel overnight, roasted it until golden brown and coarsely crushed it. Soak Toor dal in hot water for about 15-20 minutes. Coarsely grind with as little water as possible and set aside. Coarsely grind the almonds and green chili and set aside. In a heated pan, add oil and the rest of the seasoning ingredients. After the dals are brown and the mustard seeds pop, add the coarsely ground toor dal. Saute for a couple of minutes and add the crushed almond. Mix well. Add the millet rava and wheat rava. Mix well. Add in about 3/4 cup of water mix well and cover. After the water is absorbed, remove from heat. Let the mixture cool down a little but make sure it is covered. When it is safe to touch, pinch small lime sized portions and make oblong shaped bites. Place them in a greased idli plate or any dhokla plate. [I made about 20 bite sized portions]. Meanwhile, heat the steamer with about 2 cups of water. When the water in the steamer is boiling, place the idli plate with the prepared kozhakattai, cover and allow it to cook in the steam for about 12-15 minutes. Allow them to sit in the steamer for about 5 minutes and remove them onto a serving plate. Garnish with coriander leaves and serve warm with any chutney. Here is another steamed dish for the series this week. All of us face the problem of leftovers in our everyday routine. In this post, I deal with leftover rice, which is a perennial problem. There is always a mismatch between what I cook and how much is consumed at home. With two 'strong minded' eaters at home, I constantly battle with what to cook and how much to cook. As a typical Indian mom, I err on the side of cooking more than needed. The result being LEFTOVERS. I repurpose the leftovers almost all the time and here is one more idea to use up the leftover rice. Mash the cooked rice and add yogurt and sooji. Set aside. In a heated pan, add oil and the rest of the seasoning. After the dals are golden brown, add the finely chopped vegetables, ginger, green chili, chopped nuts and saute for a few minutes. Add this mixture to the cooked rice+ yogurt mixture. Meanwhile, heat a steamer with 2 cups of water. Grease the idli plates. Place a roasted cashew in each of the slots[Optional]. Pour ladleful of batter into each of the slots and put the idli stand in the steamer. Let it cook in the steam for about 15 minutes. Allow another 5-10 minutes for it to cool down a bit. Carefully unmould and serve with a chutney of your choice. This week I shall highlight some healthy steamed dishes. I have slowly begun to switch over to millets substituting rice wherever I can and I am thoroughly enjoying it. In my attempt to make consuming millets an easy transition, I have tried various methods and this dhokla is one of them. The millets here are not actually identifiable in this dhokla and so it was easily accepted. * I washed the millets, dried them on a clean kitchen towel overnight, roasted it until golden brown and powdered it. Sieve the besan and millet flour into a mixing bowl. Add in salt, ginger-garlic paste and mix well. Add in the water to make a smooth batter (idli batter consistency). Squeeze in lime juice and set aside. Heat a steamer filled with 2 cups of water, grease the dhokla plates and wait for the water to boil. Add the ENO fruit salt or baking soda [honestly, I have never used baking soda for dhokla but it is supposed to work as well], mix gently until combined and pour into the dhokla plates. I used 2 dhokla plates each 5-6 inches in diameter. Place the dhokla stand in the steamer, cover and allow it to cook in the steam for about 15 minutes. Remove from heat and run a knife around the edges to loosen the dhokla. Slice it as needed and remove onto a wide serving bowl. Prepare the seasoning - Heat oil and add mustard seeds, green chilies and sesame seeds. After the mustard seeds pop, add the asafotida and remove from heat. Add in 2-3 Tablespoons of water and into the seasoning and sprinkle it on the dhokla pieces evenly. Garnish it with grated coconut and chopped coriander leaves. Under the theme of Meal time dishes, here is the last one. This is a simple and delicious version which can be made in a jiffy. Add in the flavors which the family favors and a side dish is ready for the meal. This creamy sabji with Green beans was an accidental hit at home. My husband, in an attempt to sabotage my dinner prep plans threw in some cream into the sabji while it was cooking. It so happened that we all loved the addition of cream in the sabji and now it has become a defacto standard. He got all the praises for that 'creamy addition', though that was not the reaction he expected :). In a heated pan, add oil and the rest of the seasoning ingredients. After they dals are brown and the mustard seeds pop, add ginger-garlic paste and saute for a few seconds. Then toss in the onions and let them saute until they are translucent. Add in the green beans, sprinkle turmeric, cover and let them cook. After they green beans are cooked through, after about 8-10 minutes, remove the cover and sprinkle salt, red chili powder, garam masala and chaat masala to taste. Add in cream and mix well. Let it simmer for a couple of minutes and remove from heat. This week we are talking about quick meal time dishes and I wanted to highlight this ever popular and no nonsense sabji which is a God-send. I am not sure how the name jhanak came by, but my mom used to make this during my growing up years and that is how I remember. I am not sure if my mom used onion. But I add it. This is our go-to accompaniment for rotis. It works well for me as it is my husband's all time favorite. When I run out of ideas or veggies or time, I make this sabji. The best part is that it gets done in under 15 minutes. I keep a can of chopped tomatoes in my pantry for emergencies. It comes in handy when I need to make a quick sabji and my refrigerator is empty :). In a heated pan, add oil and the rest of the seasoning ingredients. After the mustard seeds pop and the dals are brown, add in the onions and saute until they are golden brown. Sprinkle turmeric, chopped green chilies and mix well. Add in the chopped tomatoes. Mix well and cover for a couple of minutes. After the tomatoes become mushy, add salt and red chili powder to taste, mix well and remove from heat.